This might just be the most expensive cheesecake I’ll ever make. You see, I had my oven fixed in order to make it. OK, that’s not precise. It implies that my oven wasn’t working. In fact, my oven had been working a bit too well. Say, for instance, you set it on 180 degrees Celsius. It would promptly heat up to 260. Or let’s say you set it on 140. You got 260. And 110? Nope, 260. Now usually that was just fine — my over-enthusiastic oven was particularly efficient at roasting vegetables, where temperature doesn’t really matter. 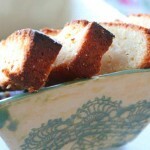 But it took me a while to figure out why all my pastries and cakes had a propensity to burn. Clearly there was something wrong with my baking. I kept a close eye on my cakes, and covered them with tinfoil to keep them from blackening. I don’t recall what it was that tipped me off that maybe it wasn’t me, it was my oven, but I figured it out beyond any measure of a doubt once I got an oven thermometer. Cheesecakes need to be baked for a long time at a low temperature, but even with my oven on the fritz, I had managed to make decent ones. Just how much better would they be if my oven were actually to heat up to the temperature I set it at, and no more? So one day, I called Shahar. Shahar is not your average repairman. First off, he’s young — about my age — and he wears snappy tennis shoes and polo shirts. Last time he came, he fixed our washing machine and then stayed for an hour to discuss Thailand with Eitan. Within a few hours, Shahar was grunting and cursing as he tried to disassemble our ancient oven. I kept him company in the kitchen, doing the dishes. He soon emerged triumphant from the oven’s grungy interior, showing me the thermostat, which had fused to itself from heat and wear. Not like I needed him to tell me something had been broken. So following that 290-shekel repair, my oven now works. Or, I should say, now it has the same problems as every other oven. It takes half an hour to heat up, and also about 15 degrees off. As if it lost its enthusiasm for the job. But on the other hand, for the first time ever, I baked a cheesecake with a perfect, white, unblemished top. It’s cheesecake season — Shavuot, the cheese holiday, starts tomorrow night. (Ariella and Miriam offer different theories as to how cheesecake became the traditional Shavuot dish.) This cheesecake is made from yogurt, not cream cheese. 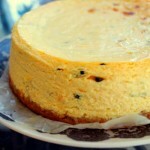 I like my cheesecakes to be soft, smooth and silky; the defining cheesecake taste is mainly from the lemon and the sugar. I don’t believe the cream cheese’s fat content is crucial to the cake’s texture, and plain yogurt wound up working just as well. The one downside is that the yogurt contains a lot of liquid relative to cream cheese, and the crumb crust absorbed a lot of it — it wasn’t very crumbly. In theory, you could strain the yogurt to remove liquid, but at that point you might as well use cream cheese, and the crust tasted fine anyway. Prepare a 16-centimeter baking ring or a spring-form pan: Put a square of baking paper under the ring, and then put a square of tinfoil under the paper, wrapping the sides of the tinfoil up the sides of the ring. Blend the crust ingredients into crumbs in a blender. Pour the crumbs into the bottom of the baking ring/pan, and pack into a flat layer along the bottom. Mix the yogurt, sugar, lemon juice, lemon zest and vanilla. Taste — it should taste like a cheesecake, but liquid. Adjust the flavorings at this point if you choose. Beat the eggs into the yogurt mix, and pour into the pan, on top of the crumb crust. Carefully slip the cake into the oven. If you’re using a baking ring, slip the cake onto a cutting board and from the board into the oven in order to give the bottom proper support (otherwise, the bottom will fall off and the cake will spill). The cheesecake needs to bake from anywhere between an hour to two hours, depending how hot your oven actually is — mine was at 130, and it took an hour and a half. Bake the cheesecake until a toothpick comes out dry (it can have some curds on it, but not liquid). Cover the cake with tinfoil if it starts to brown. Meanwhile, while the cake bakes, pit the apricots and put them into a small pot with the sugar and water. Bring to a boil and cover. Cook until all the water boils off and the apricots are falling apart, about 20 minutes. 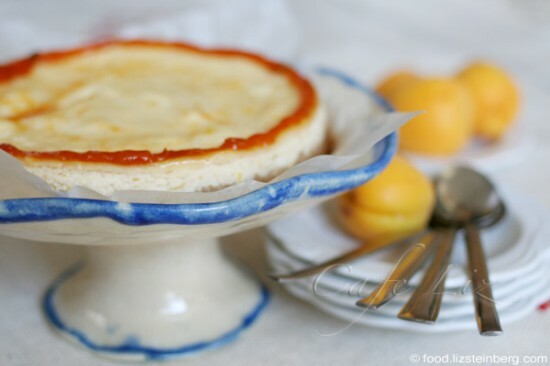 Top the cake with the apricot jam — you can use a syringe and arrange it artfully like I did, or spread it on top. (There probably will be some leftover jam.) It’ll taste good either way. 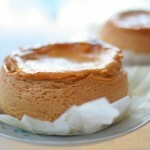 16 Responses to "Yogurt cheesecake with apricot glaze"
Very interesting idea. I bet it was delicious with the buffalo milk yogurt. This batter reminds me of what we called sweet quiche batter in France (but we used milk and/or creme fraiche, not yogurt); it is sometimes poured over fruit like apple slices in a crust to make fruit tarts. I too prefer soft cheesecakes but I never made one without the cheese. When I have substituted yogurt for sour cream in cheesecakes to lower the fat, I found I had to add a bit of flour to the batter to prevent it from soaking into the crust. Faye, thanks for those insights. It’s good to know the cheesecake’s French cousins, and the flour might have been a good idea. I’ll give that a try next time, at some point — right now we have tons of leftover Shavout cheesecake! Thanks, Liz. 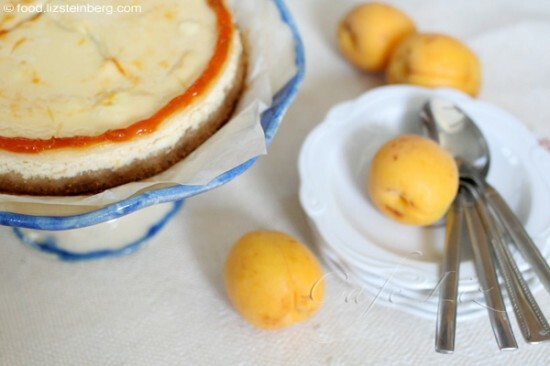 I like your idea of doing a cheesecake with Mediterranean flavors – the yogurt, apricots and lemon. Bravo! The French sweet quiches have less of a problem with liquid because I think a pastry crust is more sturdy than one made of cookie crumbs. Also, a cheesecake is taller and it’s harder for the liquid to evaporate. I wonder whether a strained yogurt like labneh might work. Lucky you, you had to call in a repairman. When my oven goes on the blitz we usually need the services of an exorcist. Your cheesecake looks so good, I can’t wait to try it. Do you think it would work with vanilla-flavored yogurt? Faye, I’d think labaneh would work too. I’ll have to save that idea for next year. And interesting, I never thought of this cheesecake as “Mediterranean” — I guess these are just flavors that I’m used to! Vanilla yogurt — sure, why not? The cake has a hint of vanilla in it. Nice! Looks great. I think I will try this recipe sometime using goat labaneh. I was also thinking of doing a petit beurre crust this year but opted for something much simpler 🙂 Love the little stand the cake is sitting on, very pretty. Liz, I think you may have absorbed the Mediterranean style of creativity from living in Israel! Of course the vanilla isn’t Mediterranean but it’s wonderful in cheesecake. This looks really delicious–I love the apricot and lemon flavoring. I made a yogurt cheesecake, too. I drained 32 ounces of vanilla yogurt to get 16 ounces of vanilla labne, but I think that 16 ounces of greek yogurt would have worked just as well. I adjusted the sugar to account for the sugar that was in the vanilla yogurt (I think the vanilla yogurt had about 1/2 cup of sugar in it). Yogurt labneh — that sounds like such a cool idea!